Check out this sneak peek on Facebook of a few of the items you can win. Money raised this year will benefit the Center for Women in Transition (CWIT). Specifically, the money will be used for costs associated with providing activities and safe spaces for children whose lives have been impacted by domestic violence. Last year, CWIT served 77 children in its emergency shelter (Ginny’s Place), 38 children in its Supportive Housing program, and 30 children in its Children’s Therapy program. In addition, CWIT provides free childcare service and dinner during support groups. This allows the parent to focus fully on sharing their experience, establishing a support network, and taking steps towards a healthier future. The agency embraces a holistic approach to healing, walking alongside the families it serves and providing assistance to both parent and child as needed. Funds from the raffle will support a variety of activities, including day passes for educational/entertainment opportunities for the children living at the shelter; upgrades to spaces at both CWIT’s emergency shelter and its Holland program office to make them more child-friendly and trauma-informed; the purchase of new, age-appropriate and therapeutic toys and games; and needed safety improvements to its playground. We’re excited to support CWIT in this important work! You’re invited to “Ladles of Love,” a Community Soup Luncheon to benefit My House Ministry on March 15, 2016, from 11:00 a.m. – 1:30 p.m. at the South Side Holland Boys and Girls Club, 435 Van Raalte Ave, Holland, MI. If you participated in Women’s Service Day last fall, you may have worked at one of the homes for women and children run by My House Ministry. The organization provides a faith-based transitional housing program for women and their children in Ottawa County. Their goal is to help women with personal, spiritual, and emotional growth, to make permanent changes in their lives. Ladles of Love is organized by community members, school officials, a job trainer from a local addiction recovery employment program, and neighborhood community leaders. A food service teacher from Holland Public Schools and 50 of her advanced food students have adopted this event, planning and working to make it a success. Soups, breads, and desserts will be provided by area restaurants and caterers. With so much community participation, an estimated 300+ guests are attending. If you’re interested in attending, and learning more about My House Ministry, order your tickets online now. Or, to avoid processing fees, committee members can drop off any specified number to a business or individual for $10 each. Tickets can also be purchased with cash, MasterCard, or Visa on day of event for $15. To-go orders will also be accommodated if you’d like to treat a coworker, family member, or friend, or can’t be there for the event. For the past three years, My House Ministry has operated two homes in Holland, serving 55 women and 15 children. This past summer, the organization filed for nonprofit status and hired a Life Skills Coordinator (case management) for residents to have guidance and accountability with their specific life goals. You can learn more about the organization at www.myhouseministry.org and on Facebook. Women’s Service Day 2015: It’s Time to Sign Up! Are you ready to register for Women’s Service Day 2015? Now in its fourteenth year, Women’s Service Day continues to extend its reach in making a difference for women and children in the Holland area. Join this growing movement (we’re nearly 150 women strong) by participating in Women’s Service Day on Thursday, October 1. Where else can you spend your time, skills, and talent helping nonprofit organizations while networking with women in your community—all in one day? 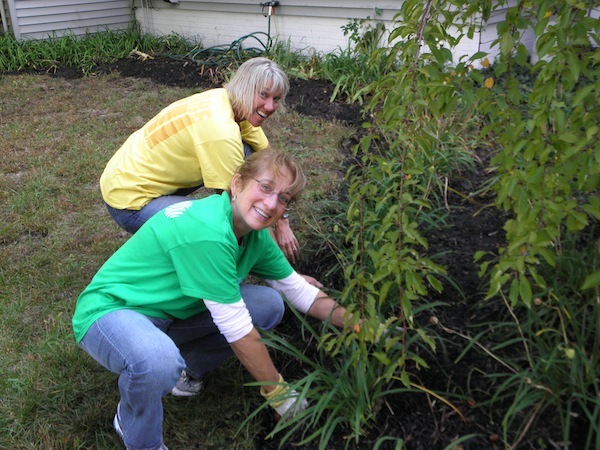 This year Women’s Service Day returns to our typical fall timeframe. In addition to volunteering at agencies in Holland, we’ll be holding a silent auction and raffle to help support continuing renovation work at Pathways MI where many of you worked hard last year to make over the lobby and landscaping. And we’ll be collecting donations for My House Ministry, a transitional housing program for women. (You can read more about this new organization in a Holland Sentinel article.) If you’re interested in being a part of this day of volunteering and networking, it’s time to sign up! Capacity is limited and you must register (first-registered, first-served) before the event to participate. Complete this online form by September 4 to sign up for a morning session, afternoon session, or both shifts. You’ll receive confirmation that we’ve received your information, and you’ll be on an email distribution list for future event communications. Remember, we’re counting on you! We plan our agency projects based on the number of registrants, so please be sure it’s on your calendar. For a morning or all-day session, plan to arrive at a worksite in Holland (we’ll let you know where) at 8:30 a.m. For an afternoon session, plan to arrive at Hope Church by noon, where we’ll gather for a celebration lunch (for which we ask a $5 donation). We’ll hold a silent auction and raffle for this year’s recipient, Pathways MI, with some proceeds covering minor event costs, so bring your checkbook! For this year’s donation drive, we’ll be collecting items to fill welcome baskets for women transitioning from shelter, rehab, or re-entry programs to independent living at My House Ministry in Holland. We thought we’d tell you what they need now so you can keep an eye out for sales! For personal items we’re collecting: shampoo, deodorant, laundry soap, toothpaste, and toothbrushes. We’ll also be collecting these household goods: 13-gallon garbage bags, Murphy’s oil spray, paper towels, dish soap, toilet paper, and hand soap. Watch for additional details about our event in future communications and here on our website. Thank you for your willingness to help! Questions? E-mail the Women’s Service Day Planning Committee. Visit us on Facebook, Twitter, or Google+ for more information. Thank You, Women’s Service Day Volunteers! During lunch, they contributed to a raffle fundraiser for the Kelly Markatos Memorial Build through Lakeshore Habitat for Humanity; together, we contributed $1,248. They also filled a van with school supplies for Sylvia’s Place. Stay tuned for the full story–with photos–to see all they accomplished in just one day! For now, here’s a peek at some of the crews at work. 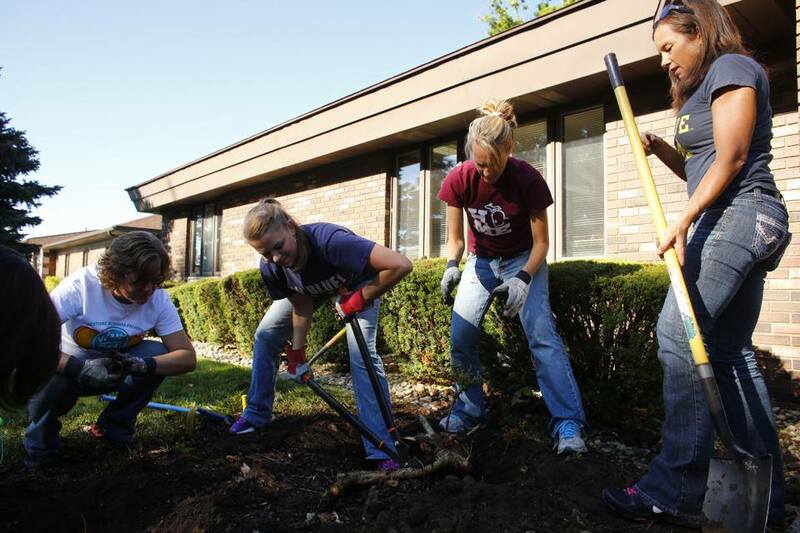 And check out the Holland Sentinel article that was published about Women’s Service Day today. Women’s Service Day is approaching fast and the planning team is finalizing details. Registered participants should have received their crew information by now. Meanwhile, we’d like to remind you of some logistics. Activities planned for August 14 will range from several crew assignments in support of Nuestra Casa neighborhood center, and a facility makeover at Pathways MI, as well as tasks at local nonprofit agencies who have come to depend on our annual event. (Read more about where we’re making a difference.) Morning crews will begin at 8:30 a.m. and afternoon crews will start right after lunch, between 1:15 and 1:30. Our lunch celebration will be from 11:45 to 1 p.m. at Hope Church, centrally located at 77 West Eleventh Street in Holland (between River and Pine Avenues, just south of downtown Holland and west of Centennial Park). We request a cash lunch donation of $5.00, collected upon arrival at the church. During lunch we’ll hold a raffle for items and services donated by local artisans and small business owners. Pricing is as follows: 2 tickets for $10 or 5 tickets for $20. Check out the slide show of raffle items, and remember to bring either cash or your checkbook! Proceeds will benefit Kelly Markatos Memorial Build, a Lakeshore Habitat for Humanity House. For our donation drive, we’ll be collecting school supplies for Sylvia’s Place, a refuge for those fleeing domestic violence. Please see the full list of needed supplies in this blog post. Finally, remember to dress for the weather and the tasks you’re assigned: work gloves, closed-toe shoes, sunscreen, and bottled water are suggested items you may want to consider. Although the forecast for Thursday looks fabulous, we know how Michigan weather goes! Our plan to do everything possible, rain or shine! Got a friend who’s heard about the great work you’re doing this week? We still have room for more volunteers. Please be sure she e-mails us her contact information immediately, and we’ll get her assigned! If you have a last-minute change in plans (sickness, business crisis, etc.) and are unable to participate—or just need directions—please contact us via e-mail as soon as possible. Don’t forget to “like” us on Facebook and follow us on Google+ and Twitter! You can also follow the day through photos and updates on Twitter (@womenserviceday) and tweet your own experiences, too, using the hashtag #WSDHolland. Looking forward to serving with you on August 14!